A Dutch 4-1/4 inch frame in a 17th-century German style, with a keyed corner along the outside and inner reeding elements. The finish shown is a polished faux "ebony" black. A 4 inch Dutch-style frame, with a steep outer lip and shallow inner panels. The finish shown is a painted black on unpolished wood grain, with yellow gold applied to the outer and inner panels. 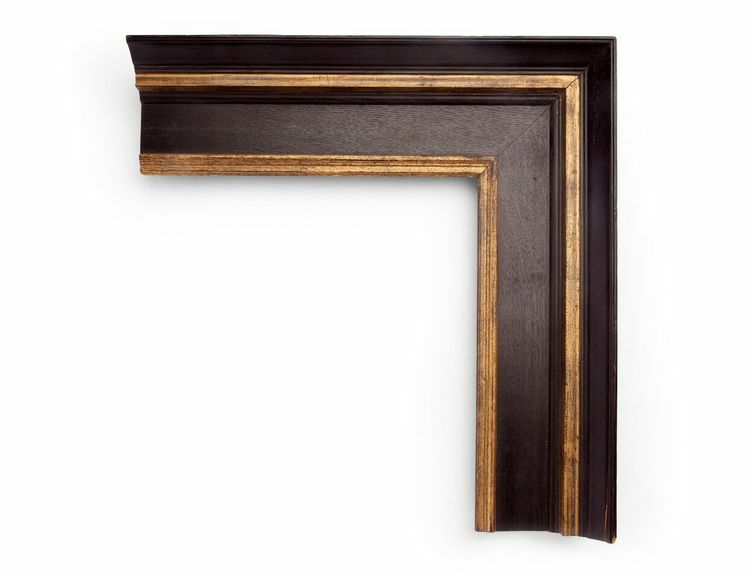 A 4 inch Dutch-style frame, with outer and inner sections of ripple decoration and center cove. 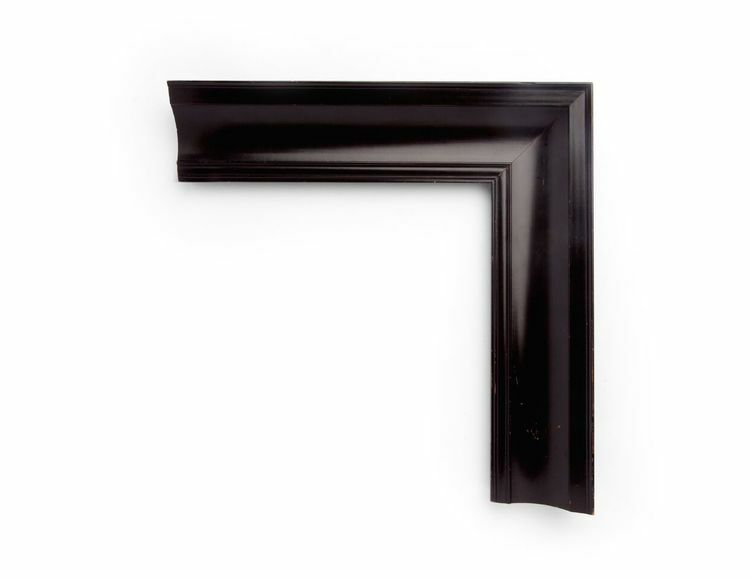 The finish shown is a polished Dutch black lacquer. 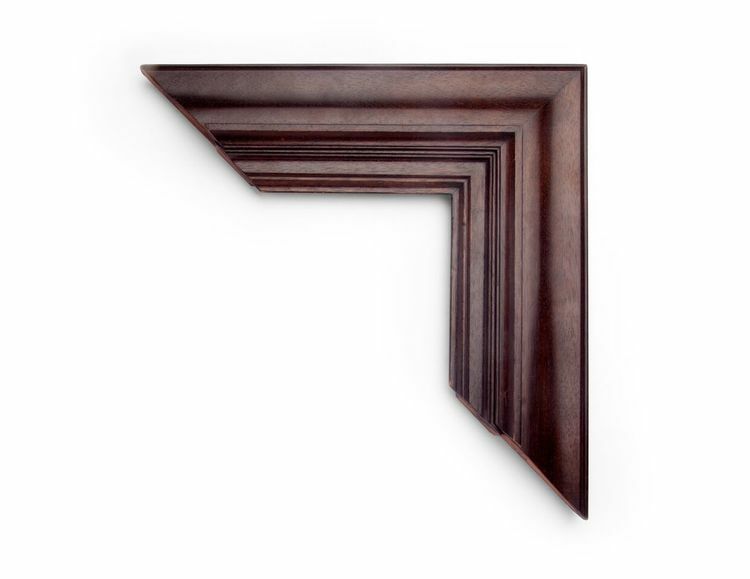 A 4 inch Dutch-style frame in mahogany, with a wide reverse ogee outside, and inner architectural paneling. The finish shown is a classic brown stain over mahogany. A 3-1/4 inch Dutch-style frame, with outer and inner thin sections of ripple decoration and a reverse ogee along the center. The finish shown is black over red clay, with yellow gold along the inner lip. A 3-3/4 inch Dutch-style frame, with a high outer edge and simple cove scooping toward the inside. The finish shown is a polished Dutch black lacquer. A 1-1/4 inch Dutch-style frame, with ripple decoration throughout. The finish shown is black over red clay. A 3 inch Dutch-style frame, with brown tortoiseshell veneer panels, outer and inner sections of ripple and bead decoration, and an inner architectural keyed corner. The finish shown is black over red clay, with yellow gold along the inner lip. This is a small sample of our selection of Dutch frames. Come in to see more.